The Pacific Northwest (PNW) Prostate Cancer SPORE comprises a coordinated effort of four institutions with established programs and strengths in translational prostate cancer research and career development: 1) the Fred Hutchinson Cancer Research Center (FredHutch); 2) the University of Washington (UW) and its affiliated institutions; 3) the University of British Columbia and the Prostate Centre of Vancouver General Hospital (UBC); and, 4) Oregon Health and Sciences University (OHSU). These institutions have large multidisciplinary teams of investigators and laboratories dedicated to prostate cancer research and a history of working closely together within this larger environment. The respective teams of clinicians and researchers at these institutions bring considerable scientific depth and breadth required for achieving our ultimate goal of reducing the morbidity and mortality associated with prostate cancer. Our translational goals are based on the basic concept of individualizing the inter-dependent triad of tumor, host, and environment to accurately understand the genesis of PC and projected outcomes, and apply appropriate prevention/therapeutic interventions. Objective 1: Develop an individualized understanding of heritable and environmental risks that contribute to the development of lethal prostate cancer, and devise screening methods and protocols to prevent, or detect and treat these cancers at a curable stage, while mitigating side-effects and maintaining quality of life. Objective 2: Develop and exploit preclinical models and systems capable of accurately evaluating cause-and-effect relationships between heritable and somatic (tumor) variation with respect to tumor phenotypes, and models capable of rapidly testing the effectiveness of interventions/therapeutics directed toward specific molecular vulnerabilities that are concordant with those found in lethal clinical prostate cancer. Objective 3: Develop new diagnostic methods and therapeutic approaches, based directly on findings from men with PC, and test their effectiveness in rigorous clinical trials that incorporate methods to understand tumor variables and response/resistance mechanisms. Specific Aim 1: Determine clinical, pathologic and molecular predictors of gDRG mutation carriers among men with mPC. Specific Aim 2: Conduct an early detection study for male gDRG mutation carriers at high risk for mPC. Specific Aim 3: Characterize the stepwise cascade genetic testing process from index cases to their at-risk first-degree relatives (FDRs). This effort builds upon our current population-based SPORE work focused on finding and validating novel prognostic biomarkers for aggressive PC and transitions towards a more direct clinical applicability. We believe our approach will be of high interest and relevance to men with mPC and gDRG, and their sons and brothers who may be at increased risk for mPC due to carrying the same gDRG mutation. At present, no unified PC early detection recommendations exist for men at increased PC risk defined by inherited gDRG mutations. Our PC early detection clinical study will use established and novel minimally invasive biomarkers with a goal of changing the standard of care for this high-risk group. Aim 1: Determine the anti-tumor activity of BET bromodomain inhibitors in patients with AR-independent CRPC. Aim 2: Identify and target critical Master Regulator transcription factors and kinases that promote AR-independent cell survival. 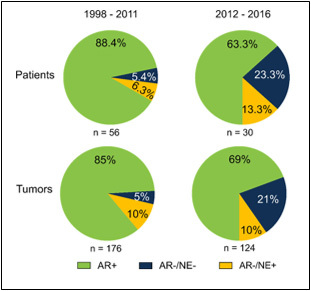 Aim 3: Identify molecular markers of transition from AR-active to AR-independent CRPC subsets and identify and target critical pathways that promote survival of specific AR-independent subsets. The completion of the proposed work will lead to the development of rational clinical trials of BETi drug combinations to block critical networks that sustain the survival of AR-independent, lethal prostate cancers. Anomalous expression of glycosaminoglycans (GAG) such as chondroitin sulfate (CS) has been recognized in prostate cancer (PC) for decades. While CS is a potentially attractive tumor antigen in PC, utility of CS variants as therapeutic targets represent a technical challenge due to inherent low avidity of antibodies towards complex GAG structures. Embracing that challenge, we have developed a cross-disciplinary CS targeting strategy for PC based on engineered recombinant proteins from the malaria parasite Plasmodium falciparum. As a survival strategy to avoid host clearance, the malaria parasite has evolved a protein VAR2CSA that mediates high affinity binding to distinct CS in the placenta. PC express the same type of CS as placental trophoblasts thus recombinant malarial VAR2CSA (rVAR2) proteins can be re-purposed to target oncofetal CS (ofCS) modification in PC. Expression of ofCS in primary PC is not restricted to the tumor epithelium but is also present in the stromal cell compartment. Moreover, the rVAR2 protein can detect and isolate circulating tumor cells (CTCs) from complex blood samples. Finally, we have an rVAR2-Drug Conjugate (VDC886) able to engage ofCS-expressing PC cells in vitro and in vivo. Combined, our technology can access and target a tumor-selective GAG structure in PC for diagnostic and therapeutic applications. Aim 1: Preclinical evaluation of VDC886 as a novel treatment for metastatic CRPC (mCRPC). Aim 2: Visualization of metastatic PC lesions by ofCS PET imaging. Aim 3: Design and execute a phase I trial of VDC886 in mCRPC. Metastatic prostate cancer (mPC) is a lethal disease with essentially no curative therapy. However, in unselected patients, widely divergent responses to conventional and experimental therapeutics are routinely observed, with occasional ‘outlier’ or ‘exceptional’ responders exhibiting durable complete responses and others exhibiting immediate disease progression. This diversity suggests that underlying biological mechanisms accounting for treatment responses can be identified and exploited to prioritize specific therapeutics predicted to have benefit and avoid treatments predicted to lack activity. 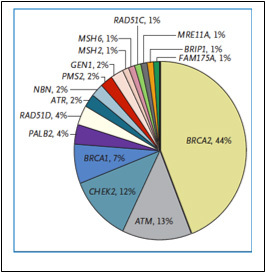 The genomic landscapes of mPC demonstrate that a substantial fraction of mPC tumors harbor somatic defects in DNA repair genes (DRGs) including BRCA1, BRCA2, ATM, MSH2/6 and others. 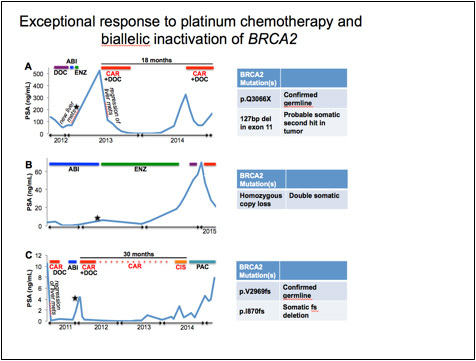 This finding has important treatment ramifications as a substantial body of preclinical and clinical work indicates that particular types of DNA repair deficiency, particularly Homology Directed Repair (HDR) Deficiency (HDR-D) result in heightened vulnerabilities to at least two drug classes: platinum (PLAT) chemotherapy and PARP inhibitors (PARPi). Also, of importance, tumors without a HDR-D genotype/phenotype are less responsive to these drugs. Specific Aim 1: Conduct Phase 2 clinical trials of genotoxic therapeutics in patients with mCRPC to determine response rates, identify resistance mechanisms, and establish associations between specific HDR genomic defects and the depth and duration of clinical responses. Specific Aim 2: Evaluate rational combinations of pharmacological agents targeting DNA repair pathways using Patient Derived Xenograft (PDX) models of mCRPC with inherent or engineered HDR aberrations. Specific Aim 3: Develop minimally-invasive biomarkers involving the capture and analysis of circulating tumor DNA capable of distinguishing patients for therapeutics targeting DNA repair pathways. The Leadership and Administrative Core (LAC) will serve to integrate and enhance the research conducted by the Pacific Northwest Prostate SPORE Projects and Cores – as well as faculty supported by the Career Enhancement and Developmental Research Programs – through the application of general administrative support and the facilitation of communication and data dissemination. (4) Representatives of the National Cancer Institute (NCI). Specific Aim 1: To provide the organizational structure, based on a group of interacting committees, for supporting and evaluating the key objectives of the PNW SPORE. Specific Aim 2: To provide oversight of all SPORE activities involving the independent research projects, the Career Enhancement Program (CEP), the Developmental Research Program (DRP), the shared resource Cores, and the parent institutions. Specific Aim 3: To organize and coordinate forums for interactions of the Executive Committee, Internal Advisory Board, and External Advisory Board. Specific Aim 4: To provide efficient and effective fiscal management of SPORE grant funds. Specific Aim 5: To communicate and consult with the NCI Project Officer(s) and staff in the preparation of required progress reports, publications lists, and regulatory documents. Specific Aim 6: To develop and maintain virtual mechanisms that efficiently facilitate multi-institutional, intra- and inter-SPORE interactions. Specific Aim 5. An administrative program to obtain samples from minorities, prioritize the distribution of specimens, ensure patient confidentiality and compliance with IRB requirements, maintain and improve quality control measures and interact with other SPOREs. Specimens from our repository, especially those from our rapid autopsy program (e.g. PC bone metastases) and our LuCaP series of prostate cancer xenografts have been, and will continue to be distributed to other PC investigators on an international basis. Specific Aim 1: Study design. Define study hypotheses, study populations, and experimental parameters to answer the research questions of interest, reduce systematic bias, and ensure a high likelihood of detection of biologically meaningful effects. As part of this aim Core C will provide power calculations when needed for each project. Specific Aim 2: Analysis and interpretation. Identify and implement quantitative methods to address the scientific questions of interest and provide valid statistical inferences about the evidence addressing the various study hypotheses. Work with study investigators to clearly communicate methods and results in study publications and insure that reported conclusions are justified. The Biostatistics Core is integral to the collection, validation and analysis of data for SPORE projects. Further, where appropriate statistical methods are inadequate or lacking, Core personnel devise and implement novel analytic approaches. The Core will provide: (1) prompt responsiveness with respect to biostatistical and bioinformatics analyses; (2) appropriate expertise to select and implement an optimal approach to study design and analysis; (3) customized dataset creation and analysis; and (4) clear communication of study findings, conclusions, and limitations to investigators and the broader community. This Clinical Core is specifically designed and supported with the objective of facilitating the translational mission of the Pacific Northwest (PNW) Prostate Cancer SPORE. Each of the five major projects directly utilizes patient-derived materials and attendant clinical data, and most are designed with a patient-directed interventional trial. However, there are major barriers between clinical, basic and population-based research that constrain progress; thus, the Aims of this Core were formulated to assist the major projects, developmental projects, and career development awardees in the rapid advancement of their research objectives. Specific Aim 1: To design, execute, accrue to, and otherwise facilitate the conduct and timely completion of human clinical trials relevant to SPORE translational science. The Clinical Core will support major research projects, developmental research studies, and clinical trials related to the Career Enhancement Program. Specific Aim 2: To design, direct, and assist with patient recruitment for biospecimen acquisition. Specific Aim 3: To direct, support, and enhance CAISIS (repository of clinical and patient-reported data) to support clinical and translational prostate cancer research across the SPORE sites. Specific Aim 4: To ensure that SPORE Major and Developmental Projects maintain a patient-centered focus, we will support and engage the SPORE Advocacy Committee in the activities of the SPORE. The Career Enhancement Program (CEP) is an essential component of the PNW Prostate Cancer SPORE that serves to sustain and enhance our mission by attracting and nurturing new and talented research faculty. The CEP will continue to implement a strategy that has successfully developed clinical, basic, and population scientists for productive careers in translational prostate cancer research. Attract and retain women, minorities, and early career junior faculty who can make key contributions to translational PC research at the institutions comprising the PNW Prostate SPORE. The CEP will be coordinated between the Fred Hutch and the University of Washington (UW); the Prostate Centre at the Vancouver General Hospital (VGH); and the Oregon Health Science University (OHSU). Our organizational structure works across sites and includes recruitment and monitoring of candidates by a career enhancement committee, educational coordination through a conference and education committee, and access to more than 50 multidisciplinary investigators both within and outside the SPORE whose research interests provide relevant experience in translational prostate cancer research. The CEP educational program combines a wide spectrum of individual research opportunities, formal educational courses, and a large number of conferences and seminars in translational prostate cancer research. We plan to continue to recruit both qualified faculty members and senior research fellows who wish to expand their work in translational prostate cancer research, focusing on the inclusion of women and underrepresented minority applicants. In addition to SPORE grant support, this program will be augmented by substantial institutional resources. The Developmental Research Program (DRP) of the Pacific Northwest (PNW) Prostate Cancer SPORE is designed to solicit, evaluate, and support innovative pilot projects in translational prostate cancer research. Projects funded under the DRP are intended to rapidly advance a new idea or concept that has the potential to substantially impact our understanding of prostate cancer, and ultimately influence the clinical management of this disease through improved prevention and treatment strategies. 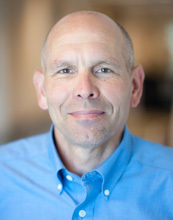 Since the inception of the PNW Prostate Cancer SPORE, the infrastructure of the DRP has established mechanisms to quickly respond to translational research opportunities within the PNW SPORE institutions that require support to advance hypotheses or confirm feasibility in order to justify larger resource investments. Developmental projects include research in basic science, clinical science, and population-based studies, and will continue to build collaborations between PNW SPORE sites and other institutions with SPOREs in prostate cancer. Monitor (and facilitate) the progress of each DRP project and consider their advancement to a full SPORE project.